Online MBA degrees advance your career while letting you keep accomplishing great things at work. We gather the details of all the most popular master’s degree programs in the United States directly from university websites so you can search by the exact criteria that’s right for you. Did you know that there are over 450 online MBA degree programs in the U.S. market? And there is no other place where you can go to get the complete details of all of these programs, except for at Online Degree Database. The details we capture include location, university name, degree name, available concentrations / specialization, total tuition, cost per credit in-state and out-of-state, prerequisite requirements, professional accreditation, and admissions requirements. With this information in hand, you can be sure that you select your short list of programs from the best online MBAs that meet your personal criteria. We save you time and help you find the right programs quickly. Click here now to research online Master of Business Administration degrees! We’ve recently completed our semi-annual update of the tuition advertised for online MBAs in the U.S. There are currently 491 online MBAs in the market today. The 2018 online MBA average tuition details are outlined below. The average tuition across all online MBA programs is $28,955 (down slightly from $28,974 in 2017). Most of the programs in our database charge a ‘unified’ price, which means the cost per credit is the same for in-state and out-of-state students. Only a few programs (N=74) still maintain different costs for residents vs. non-residents of their states. Average tuition for online MBAs at for-profit institutions (N=39) is lower, at $24,028 (up slightly from $23,748 in 2017) vs. $29,384 at not-for-profit institutions (N=448, down slightly from $29,432 in 2017) . As shown in the graphic that accompanies this post, the U.S. region with the highest online MBA tuition is the Mid East, followed by the Far West. 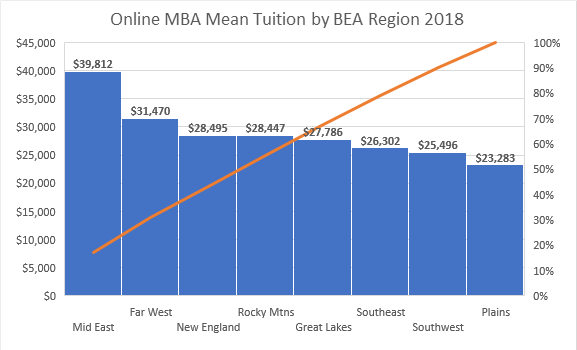 The lowest average tuition for online MBAs is found in the Plains region. Average tuition for professionally accredited programs is $31,027 vs. not professionally accredited programs at $22,940. States included in each region are as follows: Mid East – DE DC MD NJ NY PA, Far West – AK CA HI NV OR WA, New England – CT ME MA NH RI VT, Rocky Mountains – CO ID MT UT WY, Great Lakes – IL IN MI OH WI, Southeast – AL AR FL GA KY LA MS NC SC TN VA WV, Southwest – AZ NM OK TX, and Plains – IA KS MN MO NE ND SD. The Online Degree Database is the only place where both students and universities can find complete, up-to-date, and accurate details about online degree programs. Our data are sourced directly from online program websites and include: university name, BEA region, state, degree name, concentrations offered, U.S. News & World Report Best Colleges Rankings, total credits required, cost-per-credit and total tuition, delivery modality and details on required residencies, prerequisite requirements, admissions requirements, and more. Our data are collected by highly trained individuals, not scanned. We do not collect personal contact information or sell leads to universities. Our purpose is to provide unbiased, comprehensive online degree information to researching students and universities with online programs. More comprehensive information on the characteristics of Online MBA programs is available in our recent publication, Big Book of Online MBAs. Students, use our website to complete preliminary research for your online program options. Select the degree and program characteristics that are most important to you using our Interactive Tool. Get your free report that contains a short-list of programs that meet your criteria. Unlike other websites, you don’t have to provide any personal information. Use this information to move forward with confidence that you have researched all of your program options from an unbiased source of information. Using our website to research your options will save you hundreds of hours of web searching! Visit the Online Degree Database today to begin your research. We are the most accurate, up-to-date, and comprehensive source of online degree program details available in the market. Online Master of Business Administration programs exist in a highly competitive environment today! With over 489 direct competitors (as of February 2018), they differentiate their programs through adding job-relevant or specialized business discipline concentrations. Our database is the only source where all online MBA concentrations are captured. We are pleased to present the 2018 top online MBA concentrations in this blog today. Only 12 online Master of Marketing programs are available in the market today. Is the market more interested in earning the MBA first and adding specialized marketing skills second? Additionally, there are 14 online MBAs that offer a concentration in the more specialized subject of Social / Digital Media Marketing. There are 39 online Master of Finance programs in the market today. These programs also face significant competition from online MBA programs that offer a Finance concentration. Additional top concentrations, Accounting, Human Resources / HR Management, and Management, occur in slightly lower proportions. The Accounting concentration is usually designed to offer the courses necessary for undergrad Accounting majors to complete their CPA exams. Most websites clearly articulate this benefit to prospective students. Human Resources as noted in this top concentration list captures only the general HR concentration advertised on program websites. Additional HR-related concentrations we see in our data include Organizational Behavior and Leadership. The Management concentration is offered frequently. Some online MBA programs are differentiating their management concentrations by industry. For example, they offer Sport Management, Hospitality Management, or Information Technology Management concentrations to expand their audiences. It’s very interesting to note that 27% of online MBA programs currently do not offer ANY concentrations to prospective students. In addition to top concentrations, some emerging concentrations (fewer than 10 online MBA programs offer these) include: Energy Leadership / Management, Information Assurance, Innovation Management, Consulting Management, Forensic Accounting, Change Management, and Risk Management. The Energy Leadership concentrations are offered at institutions in states with strong energy industry presence, such as in Texas and Oklahoma. Innovation Management, Consulting Management, and Change Management concentrations speak to prospective students who are interested in process management / systems thinking. The assumption is they are looking to become specialized experts in consulting practices. Just how big the market is for these concentrations is difficult to assess with available data. 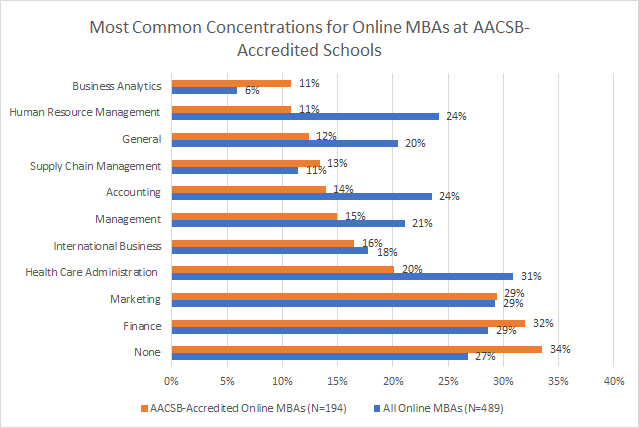 The most common concentrations among Online MBAs at AACSB-Accredited schools are Finance, Marketing, and Healthcare Administration. Just over one-third of these programs do not offer any concentrations with their online MBA programs. What does this say about the market? 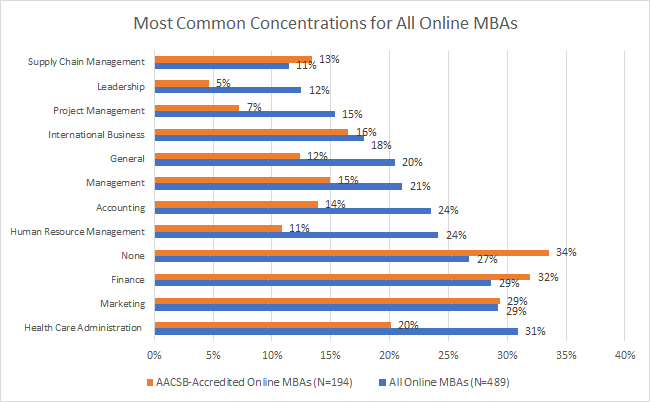 Online MBA programs, especially those without a prestigious brand asset like AACSB-Accreditation, are using concentrations more aggressively to differentiate their programs. Every relevant program characteristic in an online MBA program, including concentrations, should be leveraged as much as possible, given the highly competitive market for online MBAs. Finally, for online MBA programs, the name of the concentration game is ensuring that concentrations will add incremental enrollments to the program. This requires a careful balancing act between finding emerging markets of specialized skills and naming the concentration in a way that ensures it can be found searching online. And as we see here with the top online MBA concentrations, especially Healthcare Administration and Finance, programs add these concentrations to open up the competitive space for a program. This allows the online MBA to directly compete for students with other high-demand master’s degrees (the MHA and Master of Finance) for prospective students. To get even more information about online MBA competitors, and information about other highly sought-after online degree programs, visit our website today! Our unique, comprehensive database contains online degree program information for over 3,000 online programs. If you are shopping for an online program, we are the best and only free source of information with online degree details for over 3,500 online programs. Check out our available programs, and get your free report today. In life, there are winners and losers. When it comes to popular master’s degrees, the same is true. For twenty years, the MBA has been the degree of choice for ladder-climbing and glass-ceiling breaking professionals. More MBA’s are granted every year than any other master’s degree, by a large margin. Have all MBA programs experienced strong growth in the number of graduates over time? Which are the fastest growing MBA programs, and why are they growing? The chart above shows MBA graduate numbers using the most recent data available from the National Center for Education Statistics. These top performing universities have experienced significant growth over the past five years (2012 to 2016), growing 15% or more, on average each year. 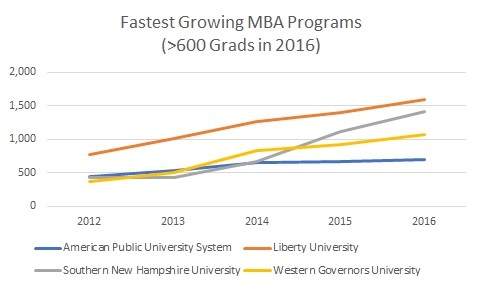 Among MBA programs that granted more than 600 degrees in 2016, there are four that stand out in terms of growth in the number of graduates: American Public University, Liberty University, Southern New Hampshire University, and Western Governors University. These programs were also the top growth performers in 2015. The MBA programs at these universities experienced the fastest average annual growth from 2012 to 2016 among all universities reporting MBA graduates these years. 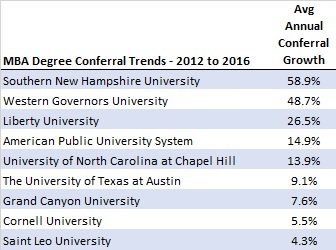 The top growth performer in 2016 is Southern New Hampshire University’s MBA, which grew 59% on average each year from 2012 to 2016. Last year, Western Governor’s program was the top performer, with a 69% average annual growth rate from 2011 to 2015. In the table, there are an additional five MBA programs that also show positive MBA graduation growth over the past five years. These growing MBA programs are at UNC Chapel Hill, UT Austin, Grand Canyon, Cornell, and Saint Leo. The five year trends for these programs also indicate consistent growth. Why is this important? When a degree program enjoys sustained growth, particularly in a category that is highly crowded with competitors, it’s safe to assume that they are doing something right. Prospective students are taking notice. concentrations add an additional 2 credits to the overall program requirements. Why Are The Fastest Growing MBA Programs Growing So Quickly? If you are looking at online MBAs or other professional master’s degrees online, get the details on programs (like what you see above) through OnlineDegreeDatabase.com. We collect information directly from university program websites. We save you potentially hundreds of hours of effort and provide you with the information you need to make the best decision possible quickly and easily. then, the easy-to-use tools at onlinedegreedatabase.com help you find the online programs that meet your needs. Use them to create your own, personalized, short-list to begin your final shopping. Then use our 10 Question Guide to speak to enrollment advisors at programs on your short list to get the answers you need to make your final, best, choice. Save hours, even weeks, of time during your search. And be sure that you’ve looked at the universe of available programs to get to the best ones for you. Universities, work with the Online Degree Database directly to access unique and relevant intelligence about the online degree market. Contact us at michelle@onlinedegreedatabase.com for more information.